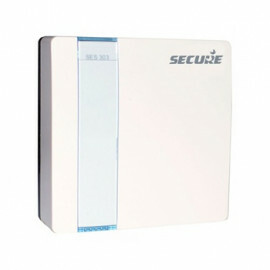 Z-Wave Programmer & Thermostat (Tx/Rx) Set - SCP318 from Secure. The innovative SCP318 Set combined wireless Room Thermostat (SRT321) and a 7 day Single Channel Timeswitch (CentaurPlus C17-ZW). Offers installers and householders the opportunity to easily and cost effectively update existing combi boiler controls. The Timeswitch will allow up to 3 ON/OFF settings per 24 hours, 7 days a week. To temporarily override current settings the device has an 1 hour manual Boost Function, which allows the user to boost the system to be currently OFF for 1 hour and an Advance Function button, which allows the user to advance the system to ON when currently OFF or switch the system OFF when currently ON. Additionally the device has a programming switch allowing permanent selection of: OFF/ON/AUTO/ALL DAY. 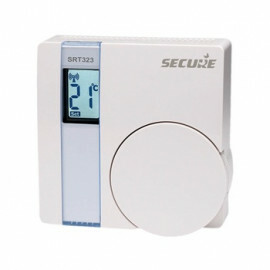 The battery operated wall Thermostat has a big adjustment wheel which can be used to preset the desired target temperature in the room in a range of +5°C to +30°C. By verifying the target temperature with the measured real temperature closed to the device, the unit decides how to operate a wirelessly attached power switch that is attached to the heater. 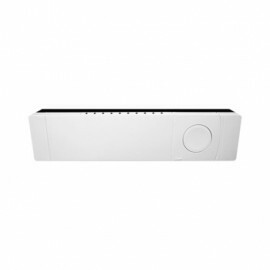 In parallel a Z-Wave Gateway or Z-Wave control software can set the target temperature using Z-Wave. This enables to realize a time scheduled zone heating.